A little about everything……..or everything about a little thing. Pinky was set up to fail. A result of a breeding that wasn’t planned and a foal that wasn’t wanted. Put out to pasture until they could figure out how to get rid of him. He became two years old in the field. Then one day he was chute loaded into a stock trailer and taken to the auction. So they could be rid of him. He couldn’t be haltered so he was run into the ring and he was confused, scared and separated from his only friend. He whinnied and screamed, he sweated and he ran. He thought about trying to jump. Who wants an Appy stallion that is un-handled? He was run back to the yard where he would wait for the “truck”. But some ladies showed up. They called to him and threw him some treats and tried to get him to come to them……but he wouldn’t… he didn’t know about treats or soft hands or scratches to the neck…but he was curious. He was then chased by some men into another chute and separated from his friend..
they chased him into a trailer…alone. He was frightened and screamed for his friend. The trailer left with him and he hung his head. A long trailer ride with bumps and sounds and noises and then……. He lifted his head and saw other horses…he called to them in greeting and they called back. Was his friend here? He looked out the trailer cautiously….he whinnied for her but she never called back. He got out and went directly into a round pen…. it had a nice stall attached…there was sand……and he rolled to get the sweat off and to get rid of his stiffness. Lots of women stood at the fence rail and cooed to him. Many months went by and he learned the women brought him food…….treats and always spoke to him. he started to gingerly reach for bits of carrots……he learned the juiciness of apples…….and he learned the soft but solid stroke of a kind hand on his nose. They started touching him with a halter…..started sitting with him in the sun…. started moving him around the pen. It was all pretty pleasant… but he longed for company. He looked forward to the women coming to the round pen…soft voices, good smells and usually a treat dispensed. Still….he really couldn’t allow the halter…..it was so scary… he didn’t mind sniffing it….or them rubbing it on him……but …it might hurt him. One day the women came with a man and Pinky was scared. He didn’t know men…….the voice was deeper and the man had a rope. The man came into the pen with him and started moving him around the pen. the rope went on him. It seemed to go on for hours and Pinky was sweaty and nervous. When it all ended… he had a halter on. He refused to come to the women that evening… he wouldn’t even eat. He hid in his shelter and shyly peeked out every now and again. This halter had a short lead on it and it hit him in the chest if he moved…..it was scary….could it hurt him? The next day he ventured out and there was one of the regular women……. she looked normal…….she smelled normal……and she had a treat. He was very interested in getting the treat and so he approached her…..not real close……but then he stretched his neck out and tried really hard to get the treat……. he had to take a step forward…so he did so… very tenuously. …maybe she would just drop it and he could get it? He had to move again. He touched her fingers and trembled a little….but he got the treat and it might have been the best treat ever……..crunchy cold carrots. He ate more cold crunchy carrots and he just relaxed. The woman reached for the lead attached to his halter and held it. She didn’t pull on him but spoke softly…and gave him soft strokes on his nose and cheek. He had to admit it felt good and he relaxed a little. More carrots were dispensed and eaten. She reached down his neck and gave soft rubs and scratches….and he wondered how it would be to really give her a good sniff…..and so he did. She smelled faintly of perfume…it was that familiar smell that he loved and felt safe with. She continued to come in with him several times a day and they progressed to leading around the round pen and he went willingly. One day she took him out of the pen and he went on a small journey to the back pastures that had stalls and other horses. He was scared, but he stayed with her because she was safe. They walked past a pond and walked past chickens…..and still he went with her. They got to a gate and walked in with another horse and he felt shy in the presence of this other gelding. The woman left him there and walked away…. he tried to follow…..because he was safe with her. 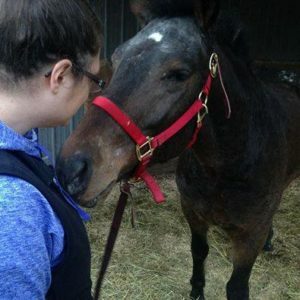 The other gelding approached him…and he shook in fear….. he reached out and gave baby mouthing signs to him to show him that he was a baby and couldn’t hurt him. The other gelding came up close and stood by his shoulder and groomed him……..
so he awkwardly groomed him back. The other gelding took him down to a big pasture and they played…..they ran, they bucked … they played chase……. The summer continued with his new friend…..he learned to eat blackberry bushes…..he learned to chase chickens and to get hosed down in the heat of the day by the woman. One day the woman came and caught him and took him out of the field and away from his friend. He got right into the trailer and when they stopped he was at a huge beautiful farm with a white barn. He was put into a big stall and the woman left him. He spoke to the horse across the aisle from him……he was better at making friends now….he had more skills. They groomed him that day and put a saddle on him…….and took him to a round pen. He got gelded and healed right up. It never made a difference to his personality……he remained the same horse. He developed some pride in himself that summer…….he had a job. He learned to hold a rider that summer and how to get a bath, and he even walked on a hot walker with some big time Thoroughbred horses. Horses who were naughty and flighty and he wondered how they had lived. 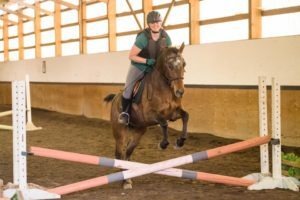 He spends his days trail riding, jumping, eating treats……being adored by the two women who chose him. Out of all those horses and all that time………they chose HIM. A small appaloosa with no remarkable features and coarse curly mane hair, no forelock and hardly any tail…….they chose HIM……and he gives them everything he’s got. Sign up here for $3.00 Thursdays! Would you miss $3.00 a week? That could be those extra dollar bills you forgot in your jean pocket before running the laundry, the coins you toss into the cup holder in your car, or the extra change that you find every few months when you clean out the couch. Doesn’t seem like much, right? Imagine though if that $3.00 of yours was combined with the $3.00 of our other supporters. If 50 of our supporters, just 50, signed up for a recurring donation of $3.00 per week, Pony Up could receive $150 per week. 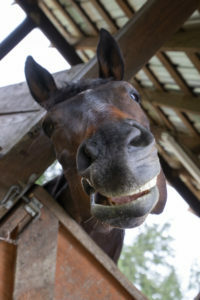 $150 a week can mean a world of difference to a horse in rehab, a horse in need of shoes, or a horse in need of training. Ready to put that $3.00 each week you aren’t missing towards a good cause? Introducing $3 Thursdays! Sign up here using the subscription button below to initiate an automatic donation of $3.00 to Pony Up Rescue for Equines every Thursday! Every little bit goes a long way and your weekly donation of $3.00 will go directly to the care of our local herd. Subscribe today and help spread the word!